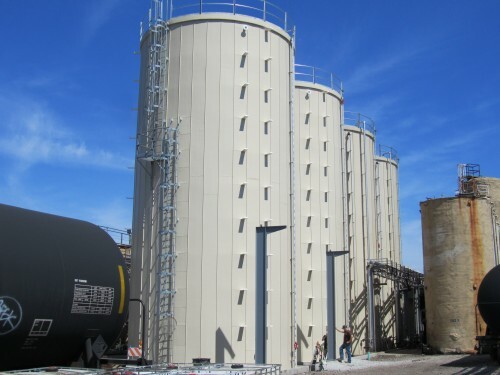 MC&I designed, manufactured and installed 4 RIDGLOK® Vertical Standing Seam Panel Insulation System on flat bolted ground storage tanks for Agri-Fine Corporation located in Chicago, IL. Agri-Fine Corporation is an Animal Feed Ingredient Manufacturer that operates mainly with Vegetable Fats, Oils, and Greases. 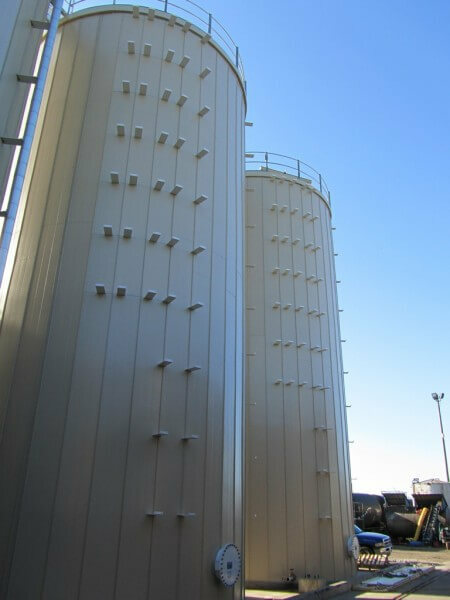 Two of the 24.62′ Diameter X 50.65′ High ground storage tanks were insulated in April 2010 and two 24.62′ Diameter X 50.65′ High tanks were insulated in May of 2012. The RIDGLOK® Vertical Standing Seam Panel Insulation System consisted of .024 Stucco Embossed Aluminum metal jacketing in Fawn color laminated with 2″ of polyisocyanurate insulation board (R- 13) using a straight pan roof system.